Our last fish recipe with French Fridays with Dorie, most are breathing a sigh of relief... but I am sad. The fish dishes we made together are some of my favorites. I really have come to the realization that you might have to grow up eating fish to like it... which is so sad to me, because it is tasty, low calorie, and high in nutrition. I can't seem to convince people to eat more of it. Of course, I made this in a slow cooker. I wouldn't want to disappoint my fellow Dorista's that I know take bets on if I will convert the week's recipe into a crockpot dish or not. ...which brings me to this recipe, which was not very tasty in it's original form. Even with pesto I found it flat. The little bit of ginger, just didn't do enough to add any complexity to the broth. Our past French Friday's seafood soups had pastis, and fish broth, to give them umph. I like subtle flavors, but I just found this soup to be monotone until I added red pepper flakes, and saffron. I really think if it had cooked in white wine, the flavor would have been even better. My family and I enjoyed it, but we will return to our liquor laden fish stews in the future. 1) Peel and chop potatoes. Put them in the microwave on high for 3 minutes before putting them in the slow cooker. 2) Layer the slow cooker with potatoes on bottom, then: carrots, leeks, scallions, salmon, bay scallops, mixed seafood. 3) Whisk together: chicken broth, ginger, salt, pepper, lemon zest, red pepper flakes, bay leaf and saffron. Pour over seafood. 4) Cook on low for 6 to 8 hours or until potatoes and vegetables are soft. Garnish with pesto. Serve with crusty buttered bread. I am impressed that you got this to work as a crockpot dish. I liked its lightness, freshness and overall loveliness. I've made a lot of seafood dishes in the crockpot, they come out terrific. You just have to make sure you put the fish on top and don't over cook it. I enjoyed this - although I did through in a few extra ingredients and changed the proportions on others. I agree this recipe needed tweaking. Too cute---I would be shocked if you didn't make an easier version. Sorry you had to boost the flavor---mine was tasty except for salmon was definitely bland. Hard to believe there's only one more recipe! Slow cooked, betcha that resulting broth tasted amazing! Am happy you didn't change your MO with this recipe. Thanks to you, I've learned that a slow cooker can be a real asset for a single person. Plus, this winter I gave my large crockpot to my caterer friend (she was thrilled) and bought another which is smaller and a perfect size for me. Highmarks to you for showing that there's very little that can't work. Interesting (but good to know) that you didn't find this recipe tasty enough. It's off-season now and no salmon or mussels (worth buying) in sight. And those spring veggies, not yet. I'm so glad that you appreciate the wonders of the slow cooker. The number of sizing available now is really terrific. Yes, perfect for a single person or a large group... especially great for busy people. I am surprised that this came out so well in a crock pot! It really looks lovely! How did you do the mussels? I added some white wine to mine because I also thought it flat, and needed some umph. My seafood dept. had wonderful fresh salmon, scallops and mussels, making this a wonderfully delicious dish! Perfect for spring! Happy Weekend, Diane! The mussels were precooked part of a seafood mix. If I was using fresh mussels I would put them in a few minutes before serving. I love your slow cooker adaptations! I'm always looking for more ways to use my slow cooker, so thank you for sharing this one. I actually liked this broth (I've been into "plain" lately), but am sure your liquor-laden version is delicious as well! method but not the flavors. Oh I want it to break. I have my eye on a high end one with all the neat features. I did not grow up on fish but I do love it now. Salmon is our go to fish at home. I have enjoyed the fish recipes that I have cooked with Dorie. I am a little finicky about some seafood. Can't believe only one recipe left. I love that you use the slow cooker! I don't have the cajones to do it the first time I make these recipes, but I know that being able to put it in the slow cooker figures largely in whether or not I'll make it again. :) So, thank you, Diane! You know, I'm one of the weirdos about fish, sort of. I grew up eating it, but don't make it at home anywhere near as often as I should. It's only been making the Dorie recipes that has forced me to do so (and I've enjoyed it quite a bit!). I need to reinstate my at least one fish dish per week rule as you're right about the benefits. Yeah, more fish, more fish... more slow cooker recipes!!! Good to hear from you. 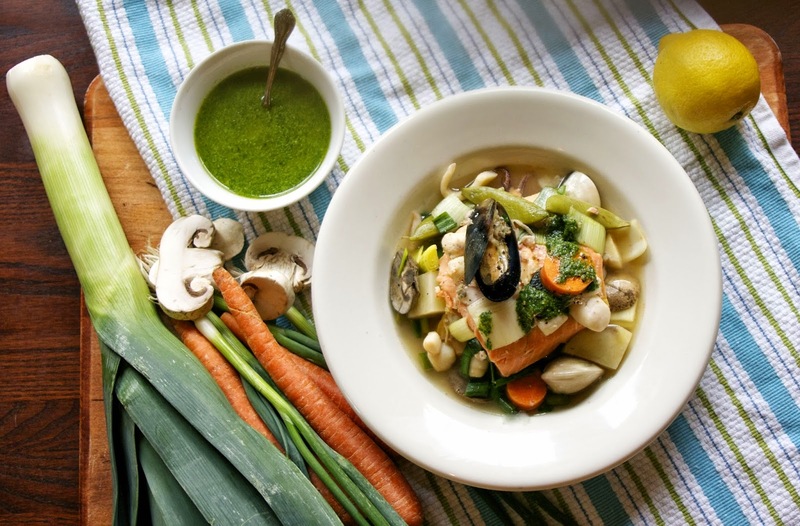 Diane, I would never have thought to prepare this Seafood-Pot-au-Feu in a slowcooker but you certainly dd a marvelous job with this recipe, showcasing each and every ingredient - sounds like your adaptations of this recipe were enjoyed by all. Hope you had a nice Mother´s Day! You never disappoint! I'm not sure your theory is correct. I didn't grow up eating fish (well awful fish that came frozen in a rectangular box), yet I love eating fish now. I actually liked the flavors in the recipe, but I used flavorful fish stock that I had leftover from an earlier FFWD dish. I keep feeling inspired by your slow cooker adaptations, though I have yet to try one. It does seem that a few Dorista's warmed to fish as adult, but people who try different cuisines and become "foodies" are out of the ordinary. I wish I had used flavorful fish stock it would have made a world of difference. What a great recipe for the Slow Cooker, this will be awesome! Hope you are having a great day and thanks so much for sharing with Full Plate Thursday this week. I love a good slow cooker meal! Thank you so much for linking up at Tasty Tuesday! Your recipe has been pinned to the Tasty Tuesday Pinterest board! Please join us again this week! It's wonderful that you were able to make this recipe in a slow cooker, Diane! 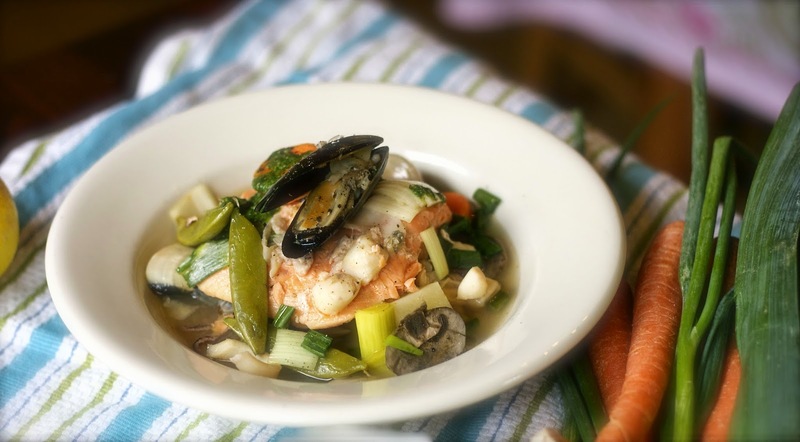 Your Seafood Pot au Feu looks so delicious - really elegant as well! Thank you for sharing it with us at the Hearth and Soul hop. Pinned and will tweet! I find that frozen seafood works well in a slow cooker.